Yours Truly KJS has been talking to Debra about her portfolio and have some exciting news pertaining to her work dedicated to Roy Wood. An exhibition of many of Debra's interpretive paintings of Roy Wood will open on Thursday 2nd February and run until Thursday 23rd February 2012 at St. Pauls Gallery in Birmingham in a three week run. And with painting titles such as "Reflections", "The Muse" and "White Magic" - one can only count down the days until the exhibition begins. 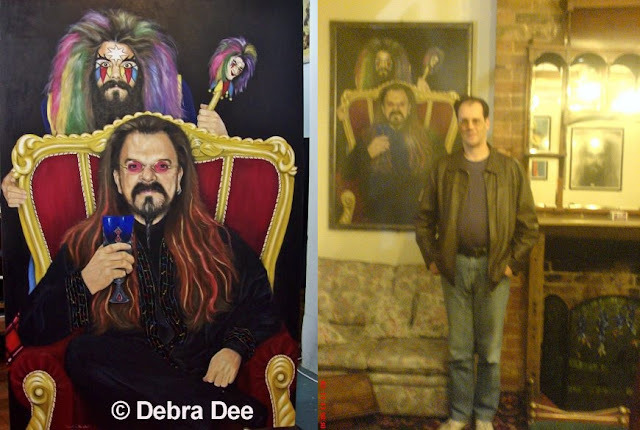 ELO Beatles Forever [ELOBF] recommends Debra Dee's Exhibition Of Roy Wood Art to those enlightened folks who also like ELO, Jeff Lynne, Roy Wood, 'Brum Beat', The Idle Race, The Move, The Beatles and related artistes. Please make the effort to visit the exhibition next February to support both Debra and Roy. Can we expect some limited edition prints ? ?